The title of this film is apt. The character of Frankenstein has gone through many metamorphoses from film to film in the Hammer series. In the first two, The Curse of Frankenstein and The Revenge of Frankenstein, he was an obsessive driver, unable to see that his experiments were beyond the bounds of ethics. He wasn’t an evil man, but nor was he good. He was somewhat sociopathic, oblivious to the offenses his work caused. In The Evil of Frankenstein he was a weak copy of the Frankenstein from the Universal films, which was no coincidence, as Universal distributed the film. In Frankenstein Created Woman, Frankenstein was almost benevolent, using his experiments, though twisted, to restore life to a pair of unfortunate lovers. But in today’s film, Frankenstein Must Be Destroyed, Frankenstein is evil to the core. He extorts, kidnaps, imprisons, murders, and rapes the poor people whom he encounters. Indeed, a person like that needs to go. 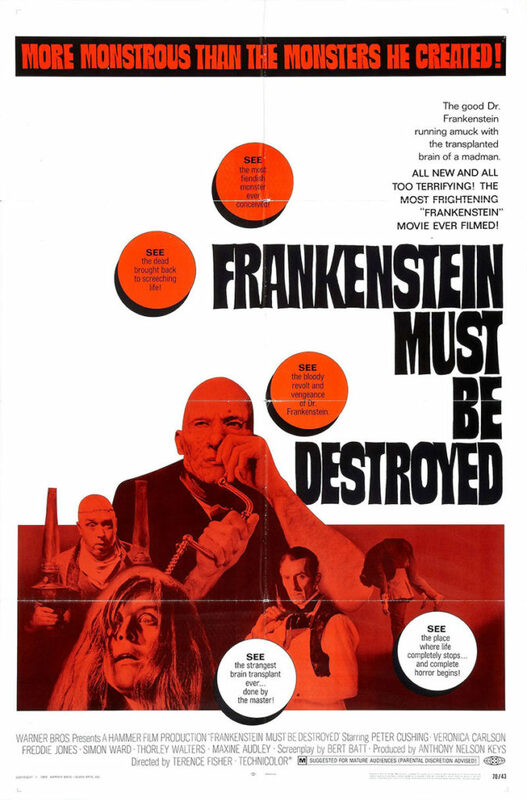 Frankenstein Must Be Destroyed comes from 1969, and was directed by Hammer stalwart Terence Fisher, from a screenplay by Bert Batt. Fisher was Hammer’s number one guy. This is the tenth film he directed that has been reviewed so far for this year’s Horrorshow. That’s slightly less than half. His films tend to be better than other Hammer films, in just about every metric — plot, photography, pacing, and performances. I didn’t plan on that being alliterative, but there it is. In proof of the Peter principle, one of his colleagues at Hammer was Freddie Francis, who won an Oscar for his cinematography before directing a handful of Hammer films. This was a man who was primed to be a successful director, but his Hammer films are b-movies through and through. Fisher was a better director than an Oscar-winning cinematographer. In this film, Frankenstein, again played by Peter Cushing, has resumed his experiments while living under a false name. After his activities are discovered by the local police, he relocates to a boarding house run by the young and buxom Anna Spengler (Veronica Carlson). It was good fortune for Frankenstein that he chose that particular boarding house in which to hole up before resuming his experiments. Anna’s fiancé is Dr. Karl Holst (Simon Ward), who works at the local insane asylum. One of his patients is Dr. Frederick Brandt (George Pravda), a contemporary of Frankenstein who was performing similar experiments. In fact, Frankenstein had been corresponding with Brandt, the two sharing their successes and failures. But, the stresses of his experiments drove Brandt mad, and now he is a raving lunatic. When Frankenstein hears of Brandt’s fate, his face lights up. It is time to continue his work. To that end, he seizes control of the boarding house and the lives of Anna and Karl, forcing them to aide his efforts. The plan is to kidnap Brandt and repair his disturbed brain. Of course, Frankenstein’s methods will be even more cruel than typical 19th century psychiatric care. Frankenstein is just as focused on his goals in this film as in any of the others. But his cruelty is what is paramount in this film. There isn’t a scene from beginning to end where he shows the capacity to be a decent human being. Even while he awaits an opportunity to resume his work he can’t help being an overbearing boor. But when he does find purpose he becomes a monster. It’s actually a little uncomfortable to watch. Denouement finally comes, as it always does in film, thank goodness. But before that there is quite the awful journey with the evil baron. Like many Hammer films, the setup is extensive, taking up about half the film. But unlike many Hammer films, the final acts are just as good as the setup, for the reason that the story keeps its originality after the setup is complete. In the Mummy films, each had a somewhat different setup, but once the mummy appeared, they were all essentially the same film. The same can be said for the Dracula flicks. How he came to be resurrected in each film was more interesting than what happened after. But with this film, Fisher and Batt sustained the suspense from the first half, keeping the film from trailing off. Add to that Cushing’s ever-reliable work as Frankenstein, and the result is among Hammer’s best horror films.